These aren’t just fintech buzzwords. Financial institutions are facing the burgeoning need to adopt new technology – or else they will be quickly left behind. Global investment in fintech ventures increased by 11 percent in 2016, making it a $17.4 billion industry, according to a recent PitchBook study. When companies fail to adopt and implement relevant technologies, it will only be a matter of time until they become obsolete. This is true for most industries nowadays – and the finance industry is no exception. Amid the rapid emergence of mobile banking, cloud computing, blockchain, peer to peer lending marketplaces and robot advisors, there’s a push for the finance industry to integrate new technology to make financial services more efficient and accessible. Businesses are constantly challenged to release new software systems that deliver better results than the previous option. “Although the finance industry started seeing the implementation of new technology about five years ago, companies have been adopting cloud-based software and are shifting accounting, payroll and reporting software to more advanced systems,” said Igor Rakhmanov, Kforce Market Vice President. By the time companies fully adapt to new software, there might be another one rolling out that can offer them more. With the constant demand for freshly-designed software systems comes the need for people to implement and manage the programs. 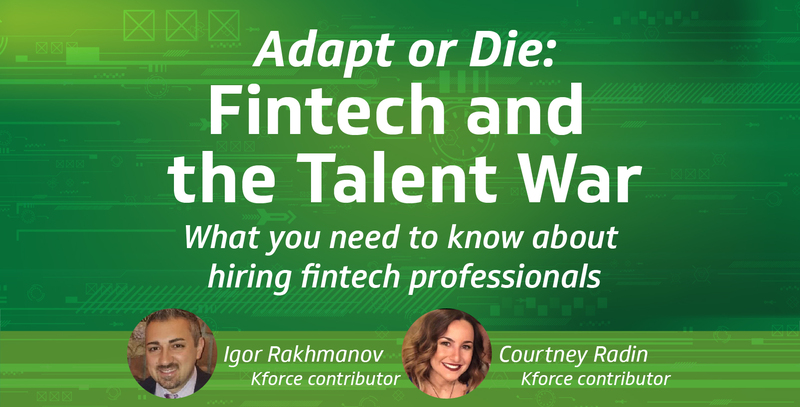 The demand for tech-savvy finance professionals has never been higher. In order to stay ahead of their competition, financial industries must hire employees who have the capabilities to manage disruptive technology. However, talent in this niche is hard to find - making it even more difficult to on-board new technology. “Whenever a client adds a new software, the company has to be able to keep up in terms of knowledge. Hiring employees with strong, readily available knowledge of software systems is crucial,” said Courtney Radin, a Kforce Market Manager. “Because finance is becoming so dependent on technology and the software that it brings with it, you need the right people to make it work. Often, it’s difficult to find perfect talent that is a part of the niche you’re looking for,” Radin said. So, how are companies supposed to keep up? Although it might feel seemingly impossible to find a well-rounded finance professional who is also tech-savvy, it is achievable. “In the beginning, the need for updating software systems had a negative effect on clients because the systems are so new that it makes it more difficult to find candidates with experience to match the software,” Rakhmanov said. As time passes and more companies adopt these new systems, there will be a larger supply of candidates with the right skill set. And with time, the salaries will adjust accordingly. Then, the war for talent starts all over again – it’s one big cycle. Success will come from staying on top of industry trends and making sure your company is ahead of the game. Financial services companies need to lead by example. It’s inevitable that companies need to adapt to this relatively new tech climate, and figuring out a plan of attack can be puzzling. Staying on top of industry trends will always begin with education. The more you can do to educate yourself and your employees, the better. “I know new systems can be daunting and extremely expensive,” says Rakhmanov. Learn about these new systems and figure out which ones work best for your company. Investing in technology and pairing it with the right talent will put your company ahead of the competition. Rakhmanov encourages companies to understand that millennials rely on the latest technology to work seamlessly. “Millennials are very efficient and are looking for companies who have these new systems in place.” This generation has its eyes peeled for companies that are embracing new technologies that streamline processes instead of operating outdated programs. Without the right talent, productivity is limited. Keep your company in the running by hiring highly-skilled millennials to apply these much-needed software systems. Rakhmanov also says that the key component to thriving in the finance industry is having leaders who are pioneers and experts. Imagine if major banks had first invented the technologies associated with innovative companies like Square, Apple Pay, Mint and Venmo. The financial services industry would be 10 years ahead today.